I have provided a link for a FREE online forex course at the end of this message. I am making this 150 page course (the course was $149 when we published it in print) FREE online because a rare investing opportunity has presented itself. In 1986, I first spotted this opportunity, when the gold silver ratio rose above 80 (an ounce of gold costs 80 times as much as an ounce of silver). 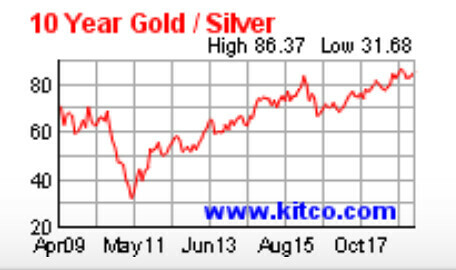 When this ratio exceeds 80… the odds of silver’s price rising faster than gold are good. Really good! I describe below how seeing that ratio in 1986 helped me make such huge profits that I wrote a report (The Silver Dip) so subscribers could make substantial, quick profits as well. But as mentioned, the opportunity is rare and did not occur again for another 29 years. When the gold silver ratio rose to 80 again in 2015, I updated the report. 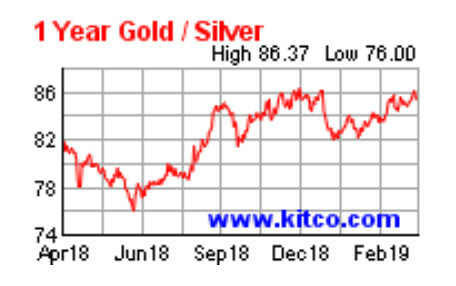 This ten year chart of the gold silver ratio shows how the silver ratio had only risen above 80 once in the past decade, in 2015. Then in September 2018 the ratio shot up to all-time highs and has remained above 80 for six months now. This is exceedingly rare and creates a huge… and potentially immediate profit potential. Knowing about a fast rising silver price can create excellent, fast profits in certain conditions. See how these conditions are described in the updated Silver Dip Report and why there is so much forex and trading opportunity right now. Then at the end of this message there is a link to the FREE 150 page course “International Currencies Made EZ”. Here’s a free course on international currencies for you. Gary, I have been receiving your newsletters since 2013 and really appreciate your knowledge and advice. 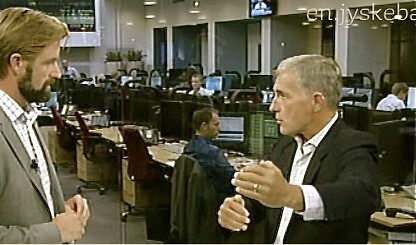 Do you know where I can go (website) to find out about Forex (foreign exchange)? Someone told me about it and I wanted to research it. I know I can goggle it but not sure what website is reputable. If you have your own opinions, that would be good. I know you are very busy. Thanks so much. 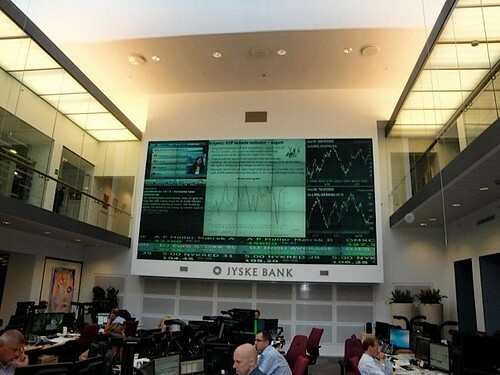 I worked on forex trading for decades with Jyske Bank, one of the largest currency trading banks in Europe. This is their trading hall. Here I am at the bank’s huge, modern trading hall in Denmark, so of course I could help this reader. I immediately replied: We have a course on Forex entitled “International Currencies Made EZ”. This 150 page course provides the basics of forex and is free online to my subscribers.